Visitor Receipts. 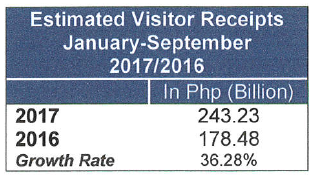 For the month of September 2017, inbound visitor receipts grew by 117.23% to to Php 30.89 billion (or US$ 605.69 million) from its Php 14.22 billion earnings in September 2016.
biggest spending market for the country. 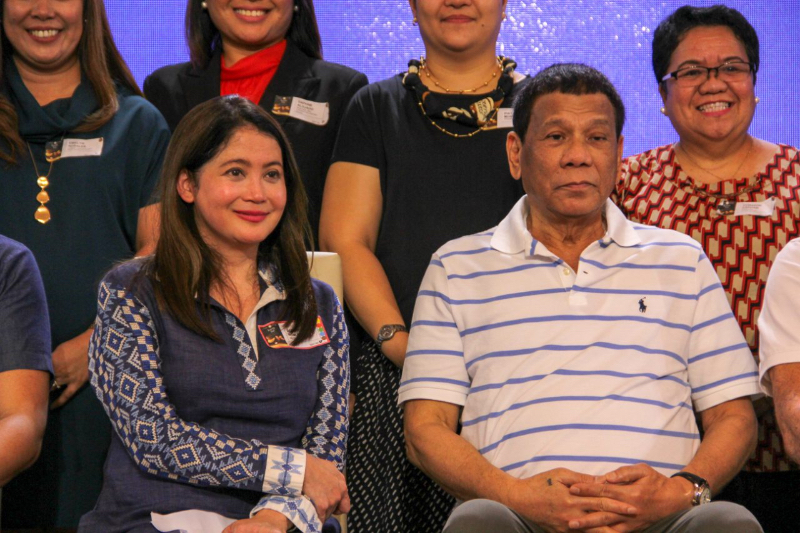 Meanwhile, visitors from Taiwan have spent an estimated Php 1.08 billion. Among the top twelve markets of the country, China registered the highest per capita expenditure for September 2017 at Php 133,344.57. 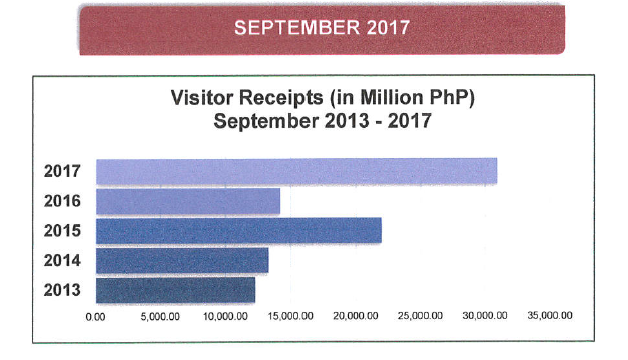 Meanwhile, a visitor from Korea has spent Php 71,213.45 while in the country to record the second biggest per capita spending. 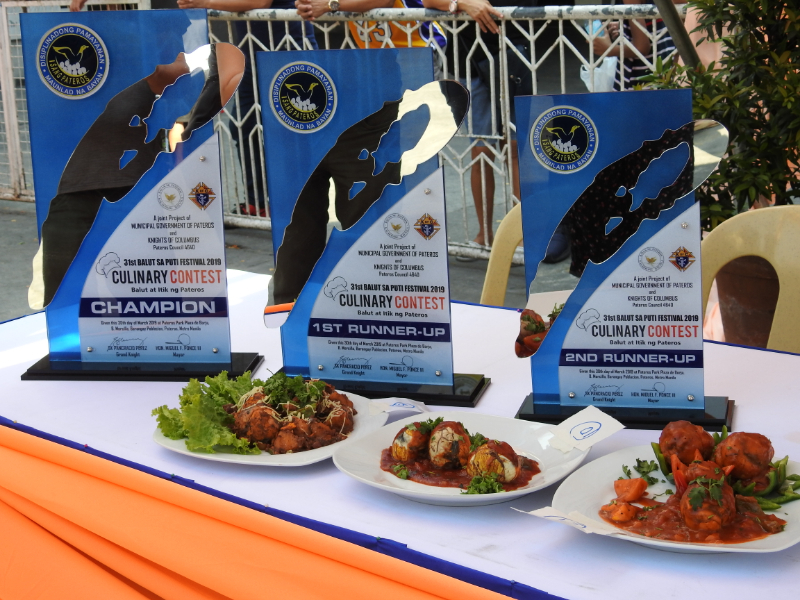 Visitors from Taiwan placed third as it recorded an average per capita spending of Php 63,041.34. Malaysia followed closely with Php 62,986.84 per capita expenditure. 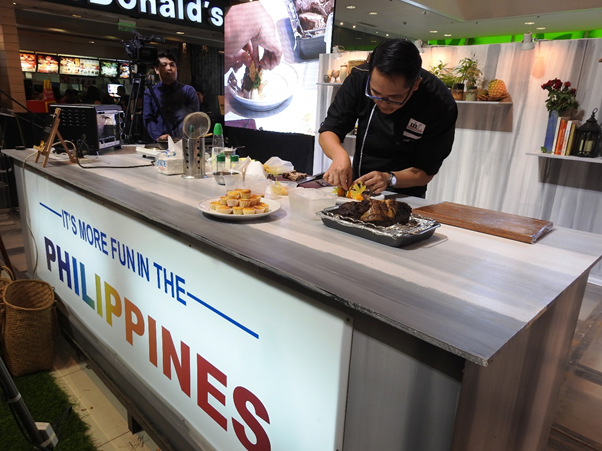 Other top markets with high per capita spending include Singapore with Php 50,579.03, Australia with Php 45,016.30, and Japan with Php 43,743.96. Visitor arrivals reached a total of 479,803 for the month of September, up by 13.44% from the same month last year of 422,943 arrivals. By sub-regional grouping, East Asia is the biggest provider of tourists with 276,829 arrivals, constituting 57.70% of the total. Korea, Japan and China which belong to this region accounted for 52.07% of the total volume. North America produced a total of 67,867 arrivals, a share of 14.14% to the total. Arrivals from this region rose by 10.09% from its volume of 61,649 last September 2016. 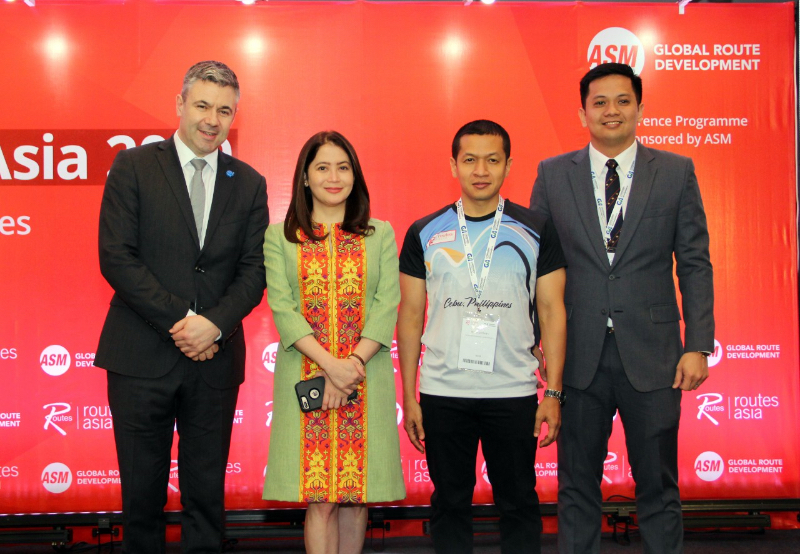 The ASEAN region comprised 9.02% share of the total which is equivalent to 43,298 arrivals. 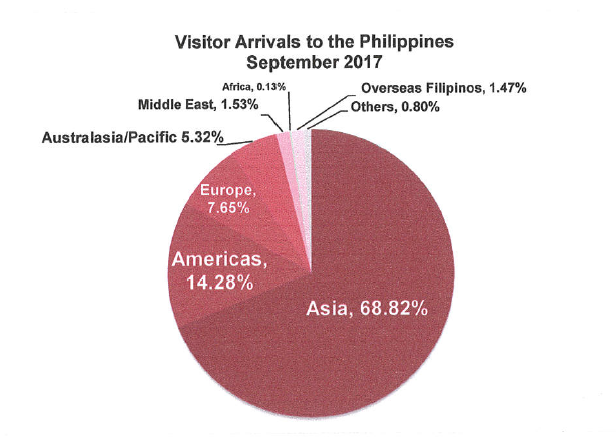 By major regional grouping, the data shows that the largest bulk of arrivals came from countries in Asia, with 68.82% of the total volume or 330,207 visitors. Arrivals from the Americas recorded 68,524 visitors, forming the 14.28% of total arrivals. 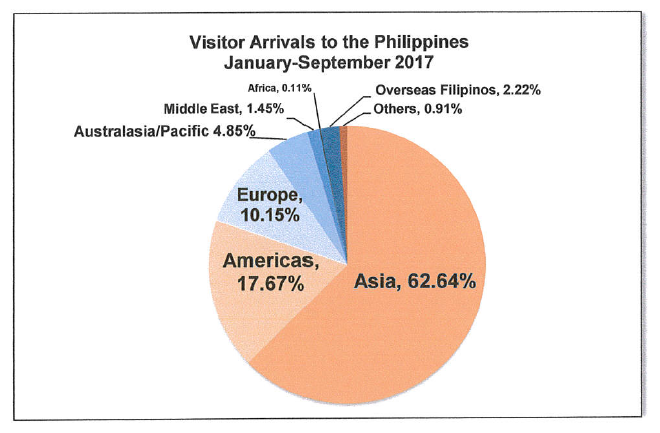 On the other hand, arrivals from Europe reached 36,697 (7.65%) while some 25,525 arrivals (5.32%) were from Australasia/Pacific. Air arrivals comprised 99.27% of the total inbound visitors, equivalent to 476,314 visitors. 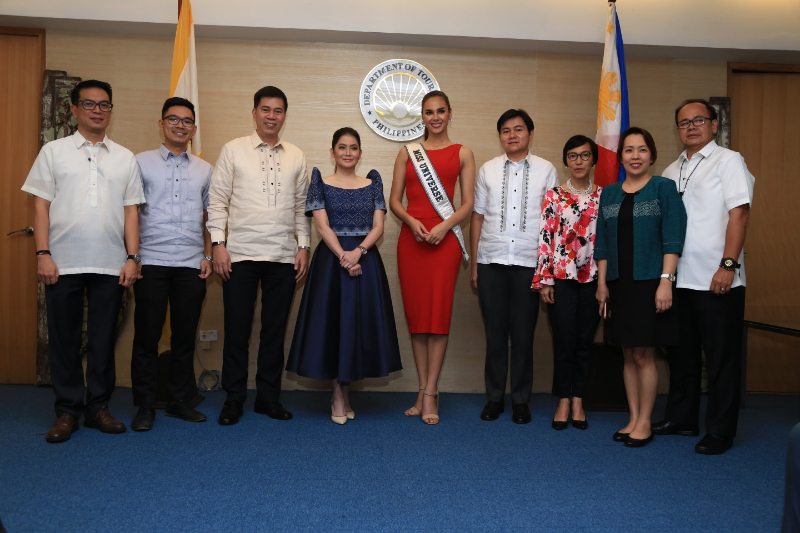 The Ninoy Aquino International Airport as the primary port of entry of the country, welcomed64.79% of the total visitor volume or 310,872 arrivals. 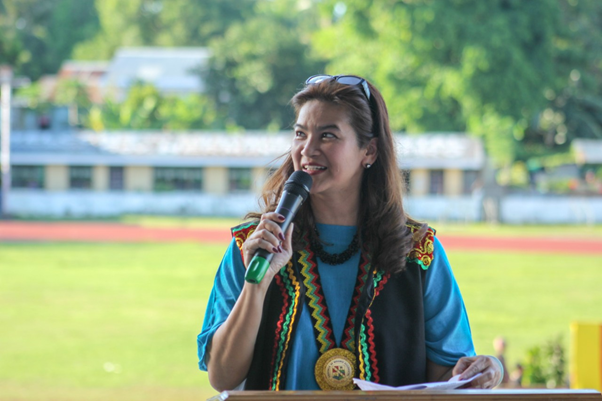 For the major airports in Central Philippines, 89,550 visitors entered via Cebu constituting 18.66% of arrivals while 51,116 visitors arrived through Kalibo corresponding to 10.65% of arrivals. 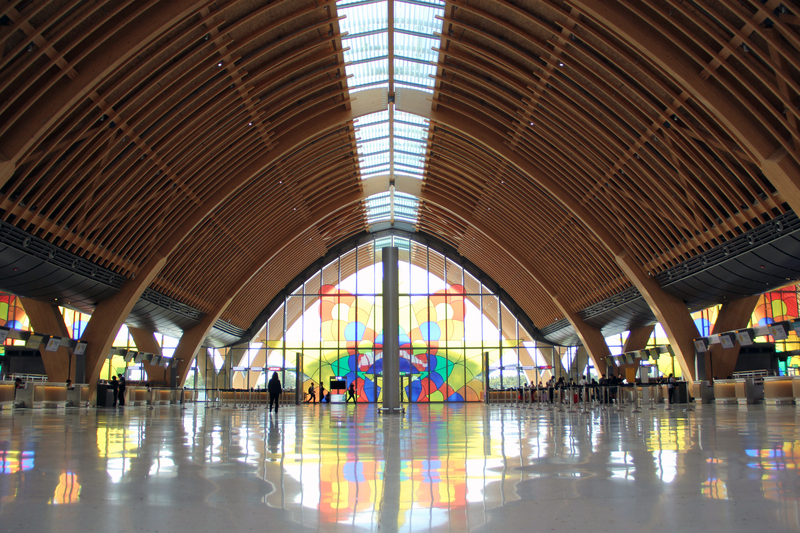 The Clark International Airport, major gateway of Luzon, recorded 17, 173 visitors. 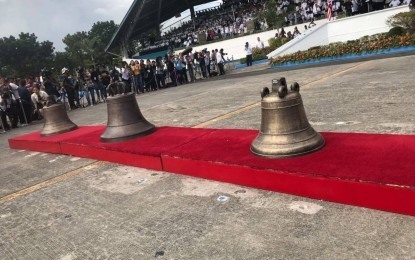 Some 5,366 visitors entered through the Tagbilaran Airport. The rest of the airports accumulated 2,237 arrivals. 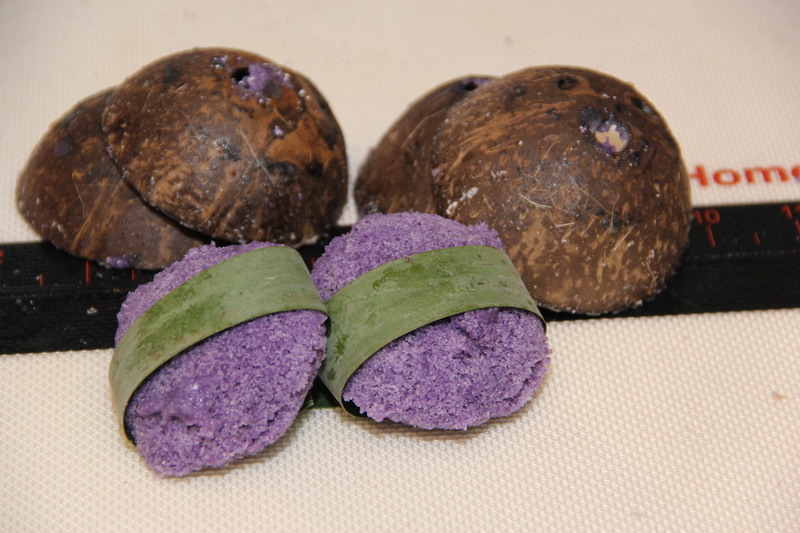 The Korean market supplied 123,834 arrivals. 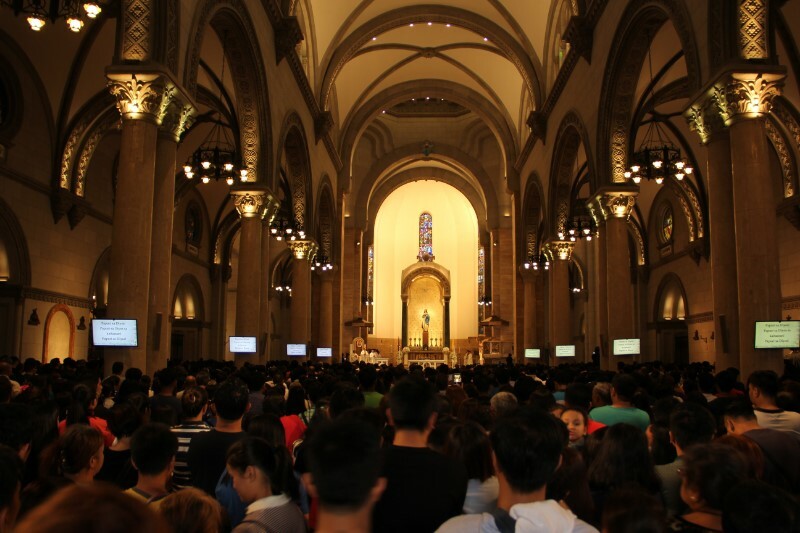 Since January, this market produced more than 100,000 visitors in a single month. China placed second for the month of September with its arrival contribution of 79,463, showing an impressive growth of 49.89% compared to its volume of 53,015 in September 2016. Although China outranked USA, visitor volume from United States likewise increase by 9.57% by producing 56,827 arrivals. Japan provided 46,553 arrivals with an increase of 6.96% from its arrivals of 43,525 for the same month last year. Australia claimed the fifth spot by furnishing 19,858 arrivals, followed by Taiwan with 17, 112 arrivals. Completing the top 10 markets are Singapore with 13, 97 4 arrivals, Malaysia with 11,541 arrivals, United Kingdom with 10,860 arrivals, and Canada with 10,686 arrivals. Arrivals from Hongkong reached 9, 187 followed by Indonesia with 8,581 arrivals. The top 20 markets this month includes the following: India with 8,389 arrivals, Saudi Arabia with 4,658 arrivals, Germany with 4,624 arrivals, Thailand with 4, 145 arrivals, France with 2,918 arrivals, Guam with 2,850 arrivals, Vietnam with 2, 798 arrivals, and Spain with 2, 198 arrivals. 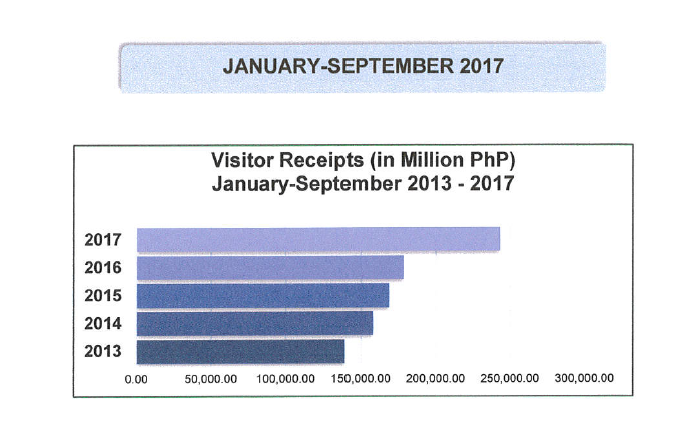 Total earnings gained from tourism activities from January to September 2017 aggregated to about Php 243.23 billion. This recorded a double-digit gain of 36.28% versus the Php 178.48 billion earnings for the same period in 2016. The month of Julyrecorded the biggest receipts of Php 33.53 billion while the highest growth of 117.23% was recorded in September. 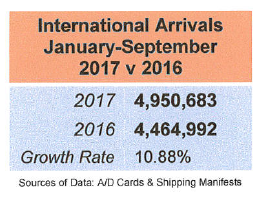 Consistent growth is observed in the country's inbound traffic with a total of 4,950,683 arrivals as of September 2017. This volume registered double-digit increase of 10.88% from the 4,464,992 arrivals for the same period last year. The biggest volume was recorded in the month of January while the highest growth was registered in april. 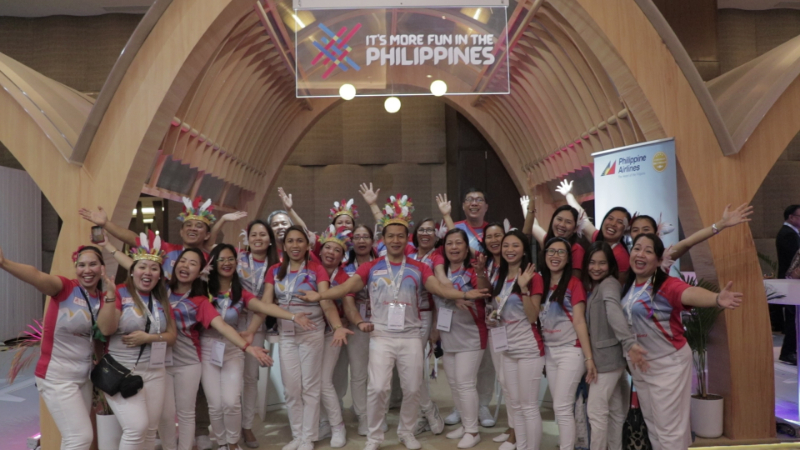 Countries from Asia still holds the biggest market share by delivering 62.64% of the total visitor volume or 3, 101,330 arrivals. 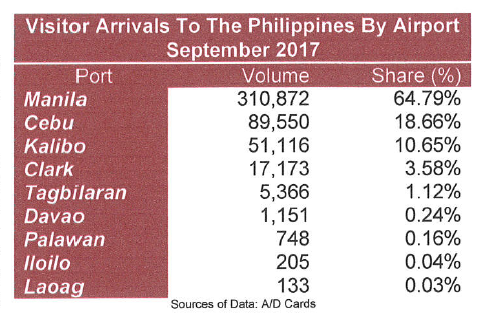 East Asia provided 2,640,999 arrivals (53.35%) while ASEAN contributed 362,882 arrivals (7.33%) and South Asia with 97,449 arrivals. North and South America supplied a total of 874,618 arrivals, a share of 17.67%. 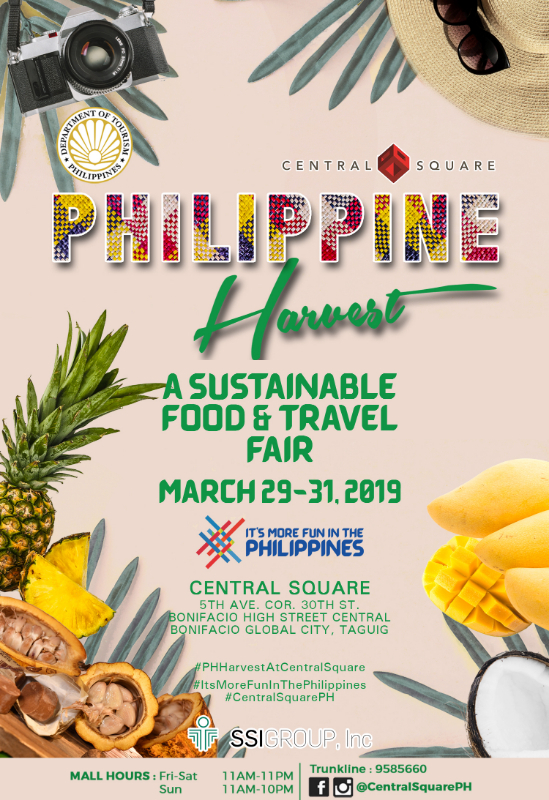 On the other hand, 502,313 arrivals (10.15%) were recorded from Europe while 240,303 arrivals (4.85%) were registered from the Australasia/Pacific. Australia which provided 186,851 arrivals secured the fifth spot with 3. 77% share to the total followed closely by Taiwan with 184,573 arrivals posting 3. 73% share. Completing the top 10 markets are Canada with 145, 145 arrivals, United Kingdom with 135,868 arrivals, Singapore with 125,442 arrivals and Malaysia with 106, 720 arrivals. Among the top 10 markets, China and Canada posted the highest growths of 34.10% and 17.41%, respectively. The top 11-14 markets include Hongkong with 83,676 arrivals, India with 80,770, Germany with 64, 124 arrivals and France with 50, 138 arrivals. On the 40,000 arrivals mark are the markets of Indonesia with 46,497 arrivals and Saudi Arabia with 44,596 arrivals. 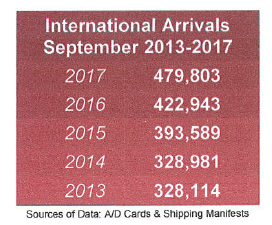 Completing the top 20 sources are Thailand with 35,818 arrivals, Viet Nam with 30,480 arrivals, Guam with 27, 109 arrivals, and the Spain with 26,802 arrivals.